It was a point apiece at the Globe Arena after Morecambe conceded two late goals and missed a penalty. A-Jay Leitch-Smith and Jason Oswell had put the Shrimps 2-0 up at half-time and set for three points. 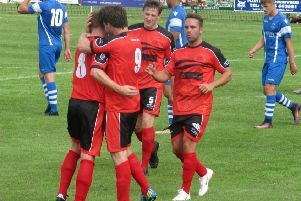 However, a contentious Antony Kay goal halved the deficit on 84 minutes before Tom Pope levelled three minutes later. There was still time for Leitch-Smith to miss his second spot-kick of the season as six minutes of added time ended with no further goals. This is how both managers reflected on the game afterwards. Jim Bentley: “I’m not going to stand here and criticise officials because they have a difficult job but we’re in a high profile game and we were looking to win a game and get up the table. “I’ve looked at the DVD and it (Port Vale’s first goal) is miles offside, it’s at least two yards offside. “These things can happen but they are happening too regularly for me and we’ve been let down. “We were miles on top, we defended well, created numerous chances and I think they have only had two shots on target – and scored two goals. “It’s a game we should have won and I felt quite comfortable; Jordan Cranston going off handicapped us a bit because we had to change the shape. “The offside routine is one we used when I was a player under Jim Harvey and we’ve carried it on. “Every time we’ve used it, it’s worked with the timing and the execution – and he (Kay) is offside, simple as that. “It goes to 2-1 and our lads at the back had kept Tom Pope quiet but like we’ve had with other teams this season, he only needs one chance. Neil Aspin: “We were terrible in the first half, we got outfought and outbattled. “You need to earn the right to be a good player, you need to roll up your sleeves against a really strong wind and wet conditions which you expect in December at Morecambe. “I thought the players let themselves down, let the supporters down and let me down in the first half. “I try to be honest as a manager; they just didn’t perform in the first half but I’ve always said if you play a team and you deserve to be beaten then I hold my hands up but what does annoy you is when a team outfights you, outbattles you and gets to every first ball. “That’s what Morecambe did in the first half, I thought they were full value for their lead and they’re going to be disappointed they haven’t won the game. “It (the first goal) is a lot closer than it looked the first time I saw it but it’s really tight but I’d have to say we got the benefit of the doubt on this occasion. “It’s disappointing for Morecambe but we deserved to get some decisions in our favour. “The way the day went it didn’t surprise me we could give them another chance.